If the kitchen is the heart of the home, the bathroom is the brain. One little room is the center of operations and the key to success most mornings. Ideally, you have a few bathrooms. Realistically, you’re sharing the area—and you can make it marvelous. 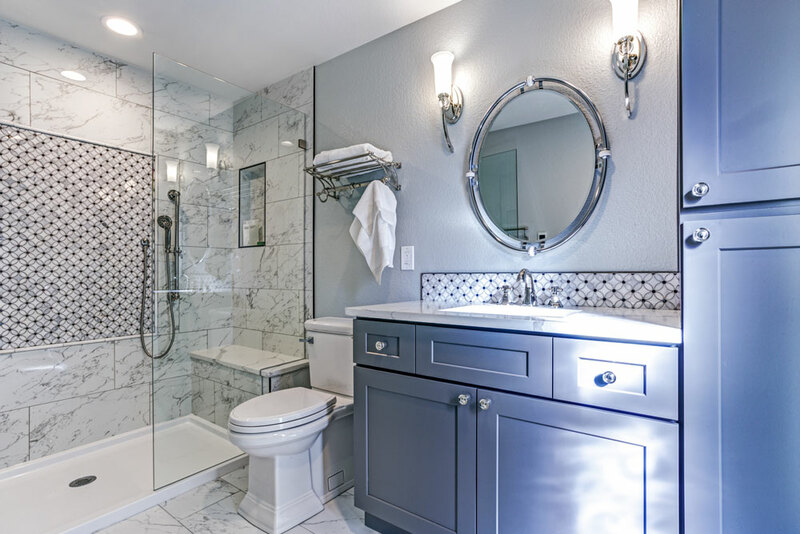 No matter the size and shape of the bathroom, more space is always a bonus. These tips will help you create a little more room in the bath. Hang a second curtain rod. This sounds a little odd, but if you hang a tension rod along the interior wall of your shower, you have suddenly created a perfect storage area for shampoos, razors, soaps, and those squishy scrubby things you can’t do without. Use inexpensive shower curtain hooks to hold plastic baskets (make sure the baskets have holes in the bottom to allow moisture to escape), and you have freed up the rims of your bathtub. Place the tension rod at any height convenient to you, and designate a separate basket for each shower user. Get creative with towels. Some wine racks make lovely rolled-towel holders. Baskets, turned on their sides and affixed to the wall, also serve as shelves to store your prettiest towels. Free up some space in your closet, if you have one, and keep your towels out in the open. A small ladder leaned against the wall creates hanging space for three towels instead of one, or a coat rack can take the place of a towel rack to triple your towel-hanging capacity. When the in-laws announce a surprise visit and you have five minutes to tidy up, it’s no fun to learn that you have only enough cleaner to tackle half a bath. Try these interesting substitutions. Scrub the tub with citrus and salt. Sprinkle salt on a wet bathtub and use a half-grapefruit as your scrubber. It does the trick, and it smells a heck of a lot better than the bleachy stuff. Pour Coke in the commode. Try dumping some dark cola in your toilet and letting it sit a while. Remember those elementary science fair displays, “This is what cola does to your teeth?” well, it does that to your toilet scum, too. Let the cola do the scrubbing. Give it a couple of quick swipes just to be sure, and flush your (now shiny) toilet. Take some risks and have some fun with the smallest—yet busiest—room in your house. Never underestimate the power of paint. Try something daring, like fuchsia with black and white accents. Or try bright yellow with a chocolate brown trim. Why shouldn’t your bathroom make you smile? Make your bathroom unique. Try a busy, patterned ceiling treatment for visual interest. Frame funny comics or interesting magazine covers because, let’s face it—folks need something to read while seated. Better yet, build a wall-mounted magazine rack. Put it near the clock so the heavy users can keep track of the minutes they’re monopolizing the bathroom.